These were popular as one of our Taco Thursday offerings. 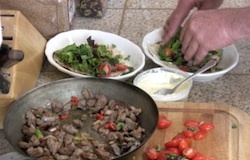 Tacos using Aioli (and/or La Rouille) are another fast and easy dinner to do, just watch the video for some fun ideas. Put 1/2 cup minced garlic in the food processor (or a little more than 1/2 cup whole garlic cloves and let it run till it's minced!) and 1 to 2 egg yolks, let it run a minute. Then add 2 cups Canola Oil by pouring it in a slow thin stream. Stop the machine and scrap down the sides start the machine and add; 1 Tbs red wine vinegar, 2 tsp lemon juice, 1/4 to 1/2 tsp ground white pepper, 1+ tsp salt. I like to thin mine a bit to make it spread easier by adding a 1/4 cup or so of room temp water, again poured in a thin steady stream with the machine running. Then add 1/2 cup Extra Virgin Olive Oil, again in a thin steady stream with the machine running. Stop scrap down the sides, taste and salt and pepper if needed. Herbs like fresh cilantro and chile flakes can be added to make this sauce more south of the borderish.